It's a game every domestic cricketer aspires to feature in. It's a game every domestic team craves to win. It's the Ranji Trophy final. To add to the zing, the south Indian rivalry will come to the fore when defending champions Karnataka take on arch-rivals Tamil Nadu at the Wankhede Stadium in Mumbai. The last time both the southern stalwarts faced each other in the Ranji final was in 1995-96, with Anil Kumble's Karnataka overpowering Robin Singh's Tamil Nadu. That match, played almost two decades ago, will have little bearing over this week's game. But two former opening batsmen would keep on reminiscing the Chepauk clash all through next week. WV Raman has now taken over the mantle of being Tamil Nadu's coach, while J Arunkumar, who was dropped for the final, has excelled as batting coach for Karnataka. Both the coaches have sounded optimistic about their team's chances. As Arunkumar admitted, Karnataka would enter the game as firm favourites. They have lived up to the billing of defending champions in style, hardly faltering during their 10 games thus far. Tamil Nadu, on the other hand, were virtually down and out halfway through the league stage, and have staged a dramatic turnaround since then. Karnataka's title defence will largely depend on the performance of their pace troika: Vinay Kumar, S Aravind and Abhimanyu Mithun have shared 116 scalps among them. Tamil Nadu, on the other hand, have relied on spinners on the turning tracks at the MA Chidambaram Stadium. With the Wankhede track likely to assist pacers, M Vijay and Co. will have to overcome Karnataka's seamers if they are to end Tamil Nadu's 27-year Ranji title drought. Manish Pandey enters the match on the back of a quiet run with the bat in the quarter-final and the semi-final. But the Karnataka batsman with a big-match reputation would be backing himself to deliver when it counts the most. In his two Ranji finals so far, Pandey has tallied 208 runs at 72.66, including a memorable 144 against Mumbai in 2009-10. He joined the Tamil Nadu squad midway through the tournament after yet another overseas successful Test series. And M Vijay continued his form from Australia to spin-friendly conditions at home. He would be keen to forget the failure in the 2011-12 final, and help his team regain glory. Tamil Nadu: Abhinav Mukund (capt), M Vijay, U Sushil, B Aparajith, Dinesh Karthik (wk), B Indrajith, R Prasanna, L Balaji, Vijay Shankar, M Rangarajan, Rahil Shah, R Aushik Srinivas, M Shahrukh Khan, A Aswin Crist, L Vignesh, Prasanth Parameswaran. 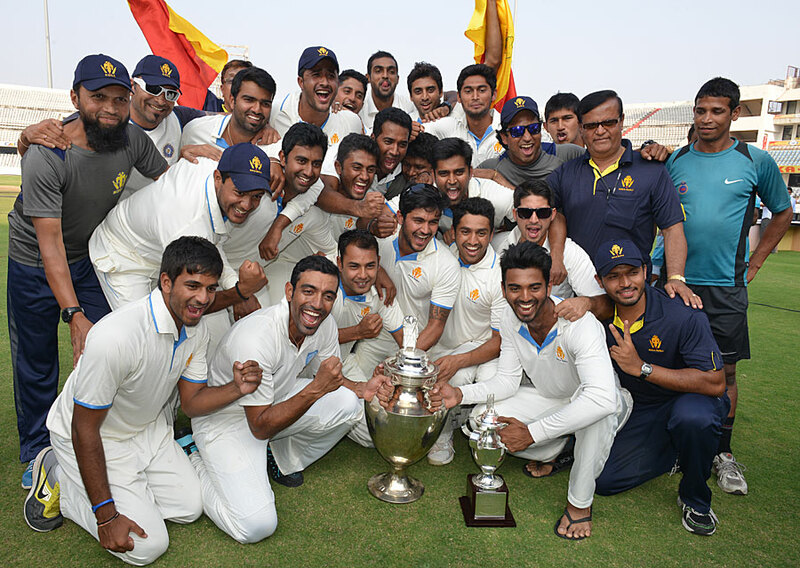 A victory in the final would make Karnataka the undisputed second-most successful after Mumbai in the history of the Ranji Trophy. They are tied at seven titles apiece with Delhi, way behind Mumbai's 40. Vinay Kumar is four wickets shy of becoming only the sixth pace bowler to take 300 wickets in Ranji Trophy after Madan Lal (351), Ashish Winston Zaidi (348), Debasis Mohanty (337), Kailash Gattani (308) and NP Singh (305). Dinesh Karthik needs seven victims behind the stumps to enter the five most successful wicketkeepers in Ranji Trophy. Karthik has 210 dismissals, while Sarabjit Singh and Mahesh Rawat have 216 each and are jointly placed fifth behind Vinayak Samant (335), Naman Ojha (267), Sagar Jogiyani (252) and Pinal Shah (246). "Tamil Nadu is a good side and we can't take anything lightly in this format, especially in a big game. They have good spinners in the team, but even we have Shreyas [Gopal], who is doing well, Udit [Patel] is doing well. Ultimately who will play, we'll decide tomorrow morning only." "I think it is going to be a battle for a lot of things. They are a really good team they have been consistently doing well over the last two years which makes them a very good team. We are a young side which is looking to do well, which is looking to win. And these small battles don't really make a lot of sense when you are looking for bigger picture and the bigger picture for us is to go out there and do well as a team."